Ace Shepherd - shepherd,geek,car guy...: How fast can I ??? One of the great things about building car models (or any models) is that it is an activity that can be done while doing something else. For example, what goes together better with watching a race on TV than building a model of your favorite race car ??? (well, other than beer and pretzels because they go pretty well with watching a race too :) That theme (building a model, not drinking beer) has been done by various model clubs, although never by any of the ones that I am a member of. Still, it got me to thinking, could I build an entire kit, from start to finish, and have it look presentable, within the time constraints of a televised race??? Most of the competitions that I have read or heard about occured during a 12 or 24 hour race. Given that amount of time, I think that to be challenging they would need to build full kits, wire the engines, polish the paint and basically have a near-show quality model when done. There are no 12 or 24 hour races that occur over the Memorial Day weekend. Instead, we have the Indianapolis 500, which I have watched or listened to almost every year since 1968, and the Coca-Cola 600 NASCAR race. For the last several years, these two races have been on Sunday, one after the other with about a 2 hour gap between them. I figured roughly 3 hours for Indy, the two hour gap and 4 hours for the 600... Nine hours to build a kit from start to finish... Not much time at all really. I decided that given that amount of time, I would build a curb-side kit (one with no engine), do a basic paint job without polishing it and no super detailing... To make things more challenging, I would do the work in the living room working on a TV tray rather than at my work bench. Plus that way, I could spend time with my lovely wife, and have the challenge of kittens jumping on my lap and playing dogs trying to tip the TV tray over :) Choosing the kit was a no-brainer. 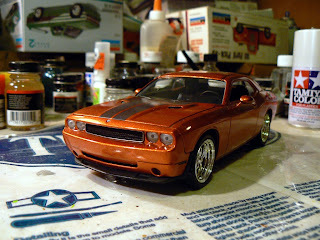 I would build a Challenger, which is my absolute favorite car, new or old. 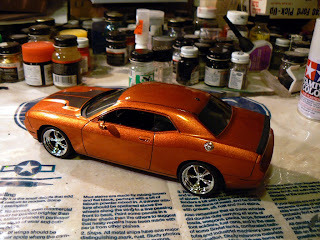 I am pretty sure that my wife gets tired of hearing about them :) Anyway, model manufacturer AMT recently came out with two kits of the new Dodge Challenger, both are curbside kits, and, most important, I have them both already. I chose the 2008 Challenger SRT. I brought the basic supplies (some files, super glue (styrene cement would take too long to dry), assorted tools and some bottle paints) out to the living room and started shortly after the drop of the green flag for the Indy 500. Even with no engine, there are still a lot of things that need to be done. I performed the basic clean up on the body parts, interior pan, dash board and chassis. During commercials, I spray painted them on the patio (my wife loves me, but not sure she would be too thrilled if I spray painted in the house :). Actually, she was still less than thrilled as I let the parts dry between coats in the kitchen, so there was a bit of a paint aroma. I decided that since the schedule was going to be so compressed I would need to use lacquer paint rather than enamel paint because it dries so much faster (minutes instead of hours). I would also limit the number of coats that I would use since I would not be polishing it out. For a normal project, I usually spray 3 color coats and 3 to 5 clear coats and then polish everything smooth as glass. For this project, I only sprayed on 2 color coats and 2 clear coats, used a little liquid polishing compound to knock down anything rough and finished with Meguire's carnuba automotive wax. The other thing I needed to control as much as possible was "orange peel". Orange peel is that bumpy texture that can occur in a paint job as it dries, kind of like the peel on an orange (hence the name). One of the things that can cause orange peel is that the paint is too cold when it is sprayed. In order to combat that, I usually warm my paint cans in a deep bowl of hot water for about ten minutes. That usually makes the paint flow on much smoother so then all I have to watch out for is runs. The real Challenger comes in 3 colors, black, silver and a reddish-orange. I decided that I wanted the orange, but with metal flake instead of just a solid color. I used Dupuli-color brand metalflake orange and then followed that with Dupli-color brand acrylic clear which has a high gloss when it dries. Once the various parts were dry, it was then time to start detail painting and assembling. I worked slowly and steadily through Indy (yay! Danica finished 3rd !) Then into the Coke 600 (uh oh rain delays )... They finally postponed the 600 until the following day which actually helped me as some of the parts I brush painted needed time to dry as my bottle paints are mostly enamels. Then once again on Monday, I set everything back up and got started when the 600 started. Once again there were a couple of rain delays and they finally called the race during the 3rd rain delay after a little over 300 miles. Was I done??? No, unfortunately, I was not finished. I had the completed interior sitting on the conpleted chassis, but the body was still in several pieces, head and tail lights were not done and windows were not installed... Things that did me in - detail painting - there were some things, such as the chassis which needed multiple colors and waiting for the enamel paint to dry between colors was long. The other thing that got me was decals. This kit included LOTS of little decals for just about everything. All of the dash gauges and displays, seats and other interior places, and all of the body badging were decals. They had to be put on one at a time and then straightened and aligned before they dried into place. I underestimated the time it would take to do them by a lot.